Noe Valley. 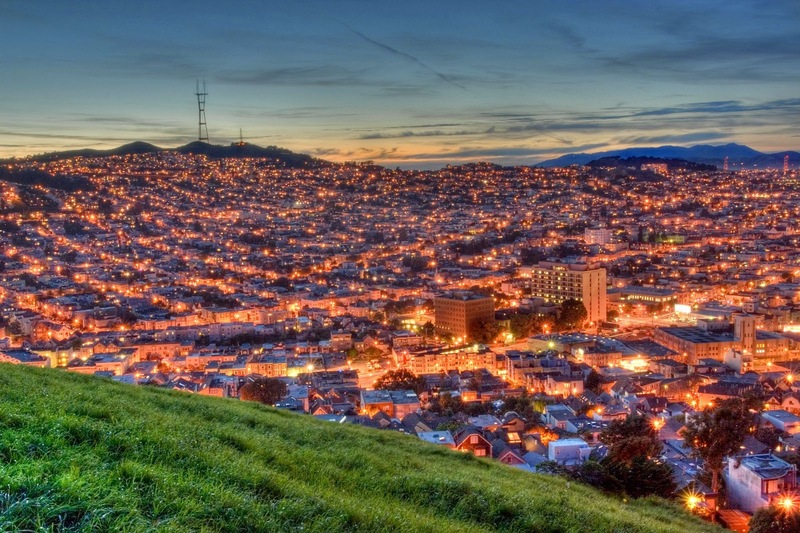 I lived there once, on the hill, on the street that cleaves Twin Peaks, in a house with a window that pictured the world – San Francisco Bay, the neon Dutch Boy sign with the child mechanically waving a paint brush, cargo ships resting like driftwood, waiting to dock. The city’s roar and diesel fumes swirled through my grandmother’s open front window on winds from the ocean. We watched TV, black and white Crusader Rabbit cartoons, played on ratty oriental carpets, broke the faux Chippendale furniture, ignored the framed prints from Sears, and relied on the house’s skylights to illuminate the gloom. When someone asks “where are you from,” images of growing up in the 1950s in Noe Valley rush in before I answer, then I tell them the truth in those two words, words that once named my universe. Our side of the hothouse—a fence divided our yards and the structure, but the long narrow hothouse was there first—it served as a playroom. We invited the neighbor kids back there and ran through the flower beds and Grandma’s thoughtful plantings: calla lilies, coral bells, primroses and iris in spring. We climbed on the playhouse roof, careful not to get pricked by the climbing Cecile Brunner rose that provided pink bouquets for our yellow tea table. Mr. Anderson, his watery blue eye trained on us through the crack in the boards, knocked on the wood when we said bad words or socked each other. My first crush, Michael Esterbrook, came over from across the street in his coonskin cap. We played saloon, Davey Crockett and Daniel Boone. I’d be Miss Kitty from “Gun Smoke” and try to trick him into a kiss, but my brothers were always there, lifting butterfly cocoons from the Shasta daisies or prying quartz rocks from the birdbath to use as ammo, distracting us. I put nasturtiums and white iris in my hair, sucked nectar from the flower tubes. Michael never kissed me. I kissed my pretty dolls as I lay them in their tole-painted toy beds. 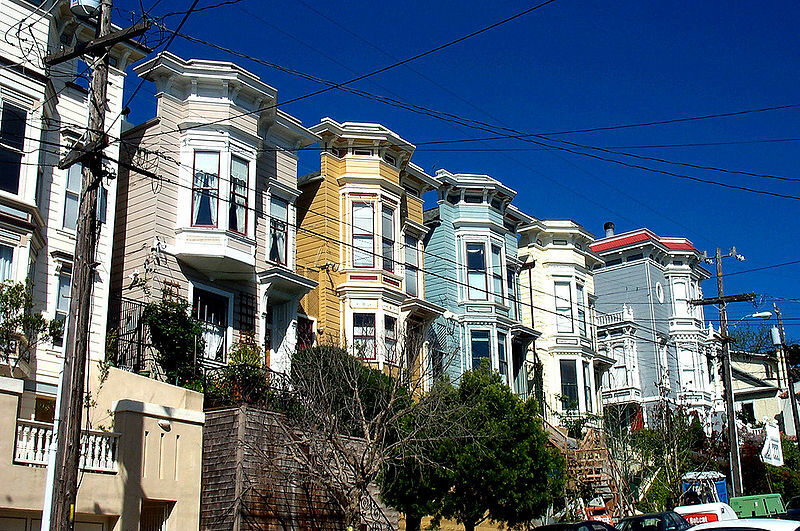 Sometimes my grandmother called us in from a back window and we’d trudge with her, all four of us kids, down to the grocery store at 24th and Castro. She’d buy lamb chops at the butcher shop, chat with the neighbors. We’d ogle the pig’s head in the shop window, peek around the paper 3-D glasses to study it’s milky eyes, get free slices of baloney from the butcher, wait for the 11 Hoffman bus to carry us back up the hill with our sacks of canned food. Back to where I’m from. 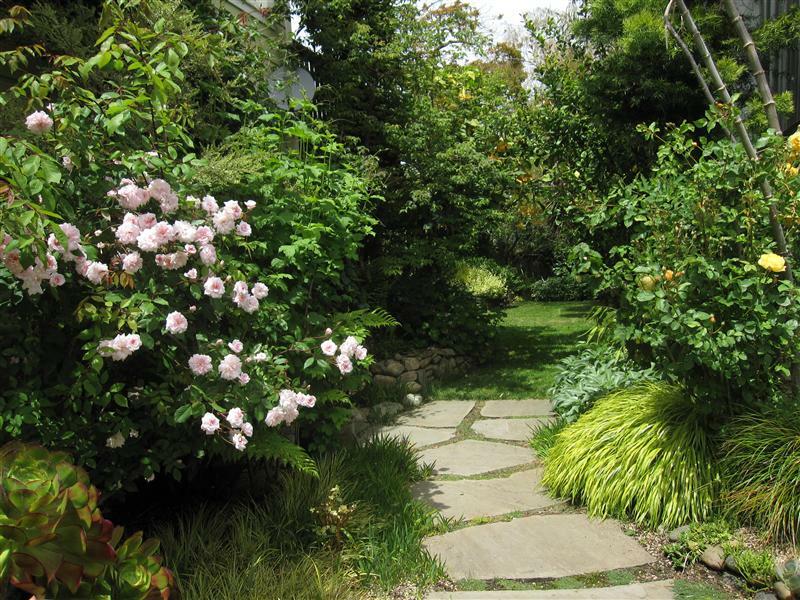 Noe Valley garden, similar to the one where I grew up. Our “playhouse” was hidden in the far back corner. 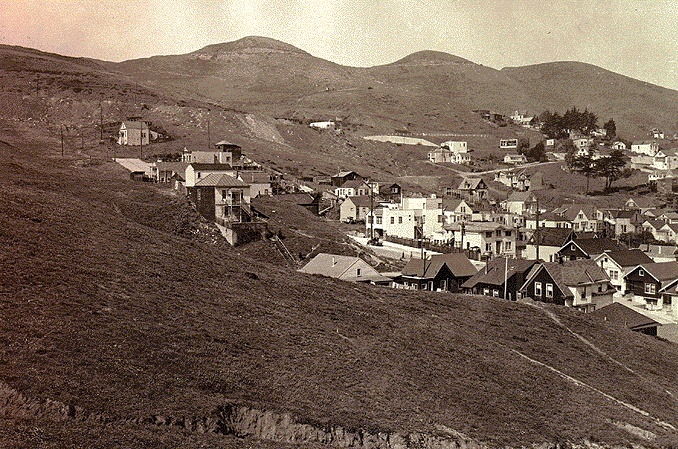 1903 image of the area of Noe Valley where I grew up. 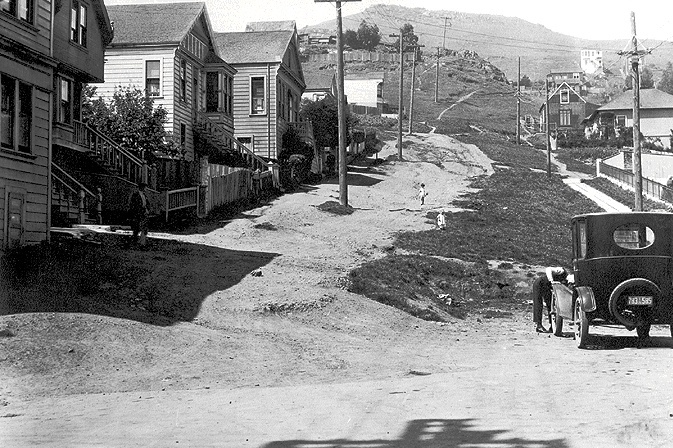 Westerly view up 30th Street from Noe, in 1926, when it was just dirt paths. 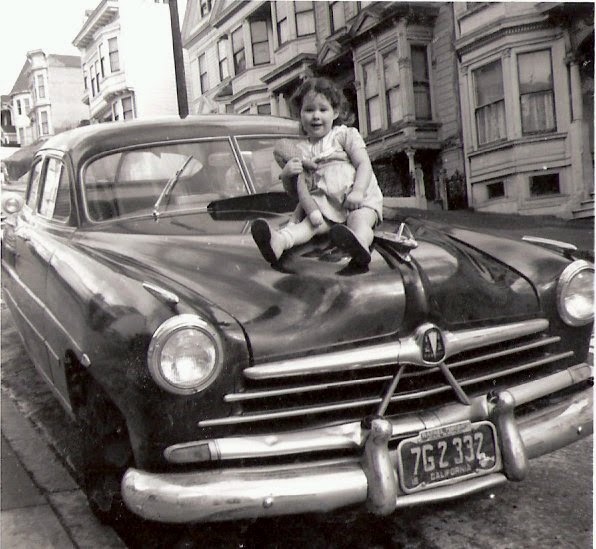 Me on our family’s Hudson Hornet about 1952. Axford House at 1190 Noe Street at 25th. Built in 1877 by William Axford, owner of Mission Iron Works. and where I later went. We had some of the same teachers. about the time my mother went there. lower yard on the right near the building that was for the girls. 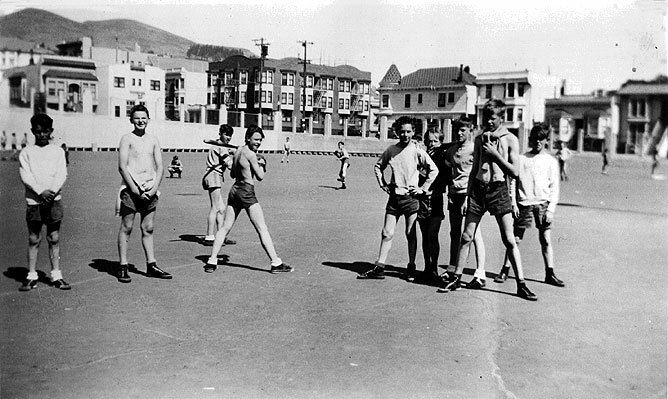 physical education was separate — and decidedly unequal. Many of the historical images in this post are from FoundSF.org.﻿ What is FoundSF.org? It’s a wiki that invites history buffs, community leaders and San Francisco citizens of all kinds to share their stories, images, and videos from past and present. 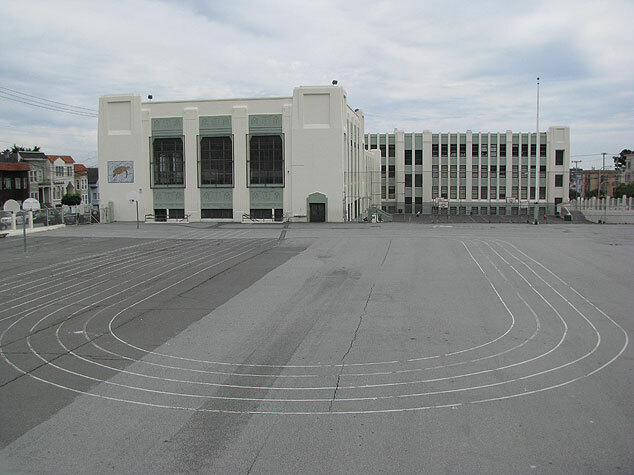 There are over 1,800 articles presenting primary sources, essays, and images from San Francisco history… and site managers hope you’ll add to it to help it grow! that first view is from bernal heights not twin peaks. 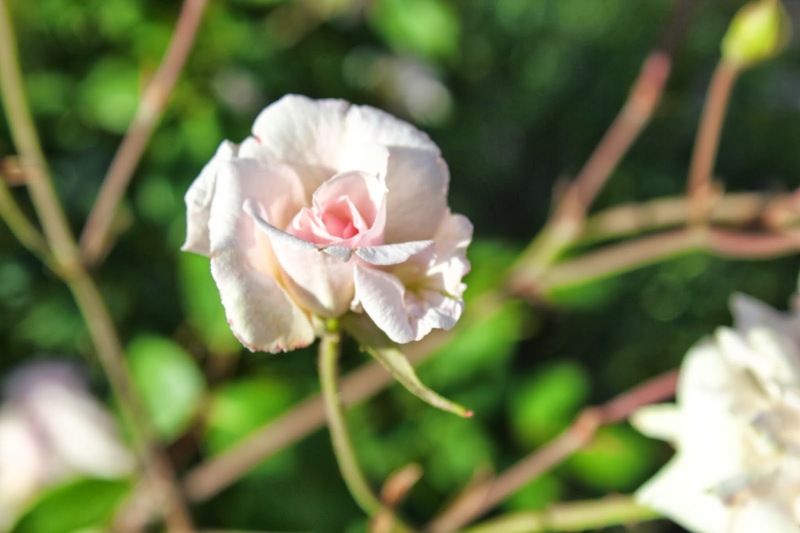 Hi and thanks for commenting on my Noe Valley post. The shot you're referring to is taken at dusk from the intersection of Hill and Sanchez Streets, on the edge of Noe Valley. It's not taken from Bernal Heights. 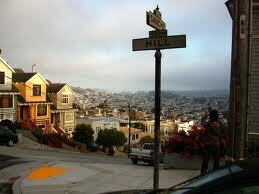 But I've got Bernal Heights stories, too. Like the one where I was grocery shopping at the Safeway at 29th and Mission and a voice came over the loudspeaker: “Will the person who owns the Great Dane and the monkey please return to your car. They are loose in the parking lot.” Sure enough, it was an urban rodeo where all the customers helped with roundup. Capuchin monkey and harlequin Great Dane. So much fun! my husband and i just bought a home in glen park. we are thrilled to be on this beautiful side of the city. 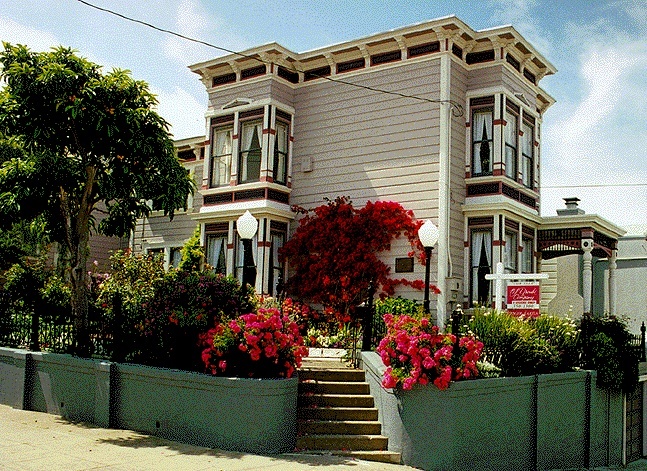 What wonderful news about your purchase of a home in Glen Park. It's a lovely pocket of the city and I hope you and your husband will be very happy there. Congratulations on finding your place in a beautiful and dynamic city. Best wishes.